Annie Douglass made this for Opening Day on ‘Nerang’ one year, beautifully presented on a huge serving dish, right down to the chilli flowers, one of which Dad actually ate! Or it can be simply tossed. The salad ingredients vary enormously from the mundane to the exciting. 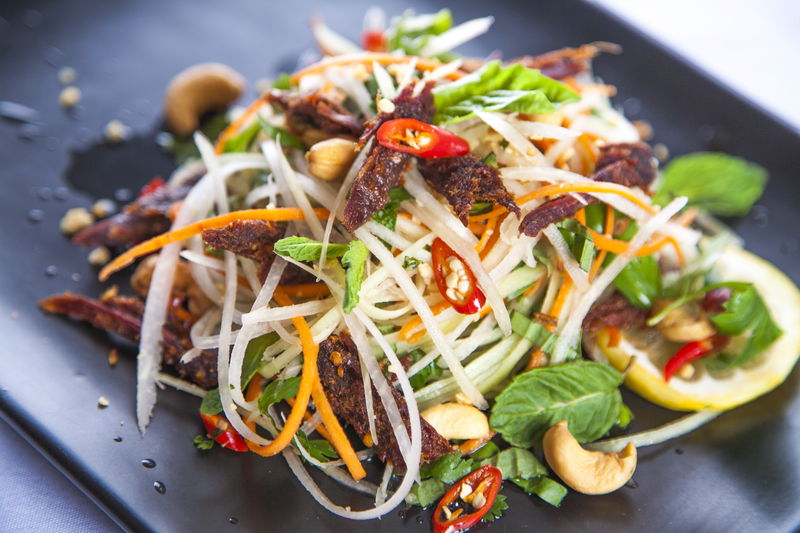 Warm roast fillet of beef tastes wonderful at any time with a Thai dressing, but the dish should contain some more exciting ingredients than tomato, capsicum, onion and chilli. Snake beans, if in season, are perfect, chopped peanuts almost a must. Snow peas are good too. Think about adding some grated green papaw, some ruby red grapefruit segments with their membranes removed so that you get little droplets of red grapefruit through the salad. Coriander and mint are, of course obligatory. Without them you might as well leave out the beef. Above all it should taste fresh. Rub the beef with oil and garlic and roast in a pre-heated oven to rare or medium rare (about 20 minutes, depending on thickness). This should be done as close as possible to serving time so that the beef is still warm when served. Blanch the snake beans in boiling water for 1 minute, drain and plunge into cold water to stop them cooking further. Strain and cut if desired. Top and tail the snow peas and remove strings. Blanch in boiling water for 30 seconds and plunge into cold water to stop them cooking further. Strain and combine with the snake beans. Slice the water chestnuts and the capsicum. Chop the garlic chives as coarsely as you like. Grate the green papaw if using, outer part of the fruit only. Peel the grapefruit, divide into segments and carefully remove seeds. Ease out the little ‘capsules’ of grapefruit, trying not to squash them as you do so. Slice the beef as thinly as possible. Either arrange on plates or place in a bowl with other salad ingredients. Sprinkle with chopped peanuts, coriander, mint, chilli and shallots. Pour dressing over the whole salad.